Corium/Concrete Interaction Experiments — Simulating reactor core melt accidents to support development of severe accident codes. MAX — A fluid dynamics facility generating high resolution data for validation of turbulence models. 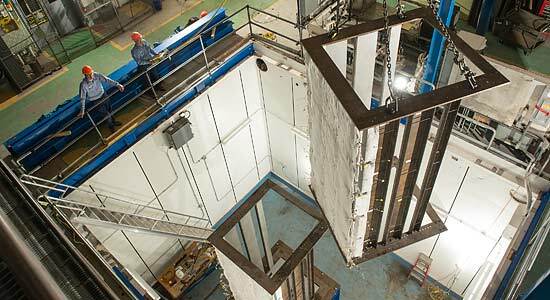 NSTF — A large-scale facility for evaluating performance capabilities of decay heat removal systems for next generation nuclear power plants. SNAKE — A Sodium S-CO2 Interactions Experiment designed to study S-CO2 leakage into sodium. We design, build, and operate test facilities that provide validation data for a variety of advanced computational tools. Our corium/concrete interaction experiments, the largest of their kind, support development of severe accident codes. These tools are used to predict the consequences of reactor core melt events such as those at the Fukushima power station. Computational fluid dynamics (CFD) codes are being used to predict heat transfer and fluid flow within nuclear power plants. They are utilized in new plant design as well as efforts to increase safety margins in existing plants. Our two fluid dynamics facilities support CFD code development: MAX, which generates high resolution data for validation of turbulence models, and the large-scale NSTF, which simulates an emergency cooling system for next generation power plants. Our sodium and supercritical-CO2 experiments examine fundamental heat transfer, fluid mechanics, and chemistry phenomena to support design of advanced nuclear reactors and energy conversion systems (advanced Brayton Cycle).